For a long time, our theme was to view all sharp pullbacks through a bullish lens as the trend based on our trend indicator was trading firmly in bullish territory. Secondly, one critical psychological component was in our favour too- the masses were either bearish or they cursed this market from the sidelines (neutral camp); hence the slogan the most hated bull market in history. We must deter for a second by stating that a mild or brutal correction comes down to what level you embraced this market. If you embraced this Stock Market Bull in the early stages from 2009 -2011, then a mild correction would seem brutal or back breaking in comparison to someone who just jumped into the market. A 15-20% correction would knock the socks out of them, but for you, it would appear to be nothing but a blip; this is why we have consistently stated that the best time to open long positions when the masses are in a state of despair. Having said that what does the future hold? Towards the end of last year around Dec, we stated that we were getting a tad bit nervous as the crowd had started to embrace this bull market. Up until the Trump win, which we saw as a bullish event for the markets, while most experts viewed it as a death omen, the masses were either bearish or sitting on the sidelines. Bullish sentiment was generally below 40%, and the combined score of the individuals in the bearish and neutral camp was almost always above 55% and in most cases above 65%. After Trump had won the markets experienced an initial shock but recouped twice as fast as they did with Brexit and never looked back since. During this monstrous rally, the sentiment gradually started to improve, and for the past 11 weeks, the percentage of individuals in the bullish camp has always been above the 40% mark. On three occasions in the past 11 weeks, the bullish sentiment soared above the 50% mark something we had not experienced even once over the past 30 months. As we pay close attention to the masses, this had to be treated as a significant development. 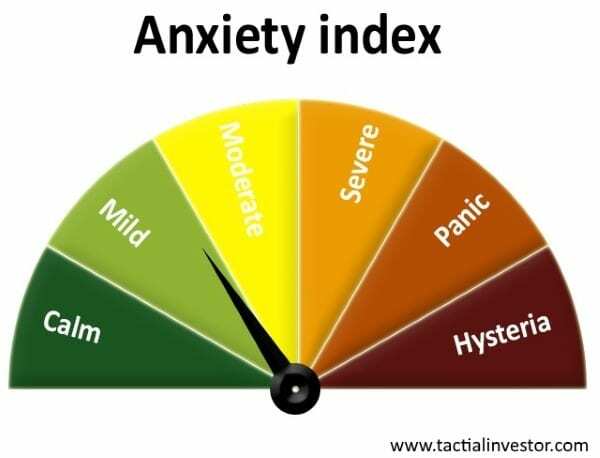 The anxiety index for the past 24 months has oscillated between the severe and hysteria zones. At the moment the gauge is sitting in the mild zone. When we combine this with the fact that more individuals are embracing this market, it suggests that being cautious might for the 1st time in many months be the most prudent form of action. Additionally, the markets are extremely overbought and are begging for any excuse to let out some steam. The Dow has experienced a new vertical takeoff after the results of the election results were announced; -fast, furious breaks outs are usually followed with substantial pullbacks. As can be seen in the above charts the technical indicators are trading in the extremely overbought ranges and given the massive change in sentiment over the past two months caution is warranted. The risk to reward ratio is not in favour of the average investor anymore. The market needs to let out some steam; a 10% pullback would be quite nice and would pull it back to the point of the current break out-former resistance turned into support. This would be enough to scare the living daylights out of the masses. In this case, we would favour an even stronger correction, perhaps a test of the 200-day moving average which would put the fear of God in almost 90% of investors and thus creating a splendid buying opportunity for the astute investor. Our goal is not to focus on ideal targets but the mass sentiment, and that is why we have developed a host of tools to monitor the masses one of which we have posted above. If the Dow drops down to 18,000 ranges, but the masses are not fearful, then we would not view the situation as a buying opportunity. A weekly close below 19,600 will signal that of the 18,200-18,600 ranges is likely. If the markets close below 18,200 on a weekly basis, it is possible they could trend much lower, but we do not want to look that far into the future and will address that hurdle when and if the Dow touches that zone. The masses panicked when they found out that Trump had won. The fake news media sites started huffing and puffing about the dire consequences the markets would face if Trump won. Several weeks earlier we went on a limb and in an article titled “Mass Psychology states Trump win Equals stock market buying opportunity” we made the following comments. We repeatedly advised our subscribers to view a Trump win through a positive lens. However, now we feel that the markets have priced in the all the positive factors associated with a Trump win (at least in the short term time frames) and some bloodletting is in order. In other words, it might be time to put the principle of “buy the rumour and sell the news” into use. When you think about it, everything comes down to perception. Alter the angle of the observation slightly, and you modify the perception. What appears bullish to one could be viewed as an extremely bearish development by another. When it comes to investing the goal should be to determine what view the masses hold whether it is valid or not is irrelevant for the difference between a truth and deception comes down to perception also. If the masses are leaning strongly towards a particular outlook, history indicates that taking a contrary position usually pays off. 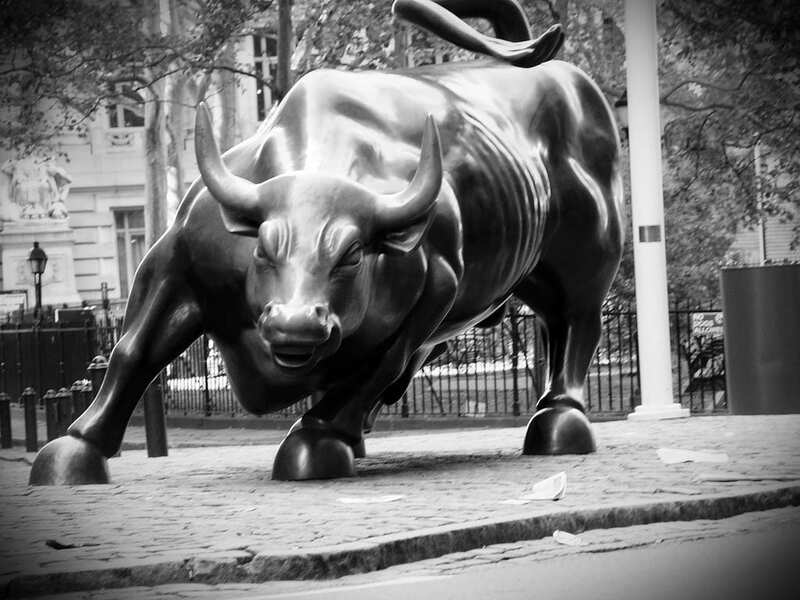 The masses have for the first time embraced this bull market. From a mass psychology perspective, this is alone is not a huge negative. Mass Psychology dictates that the masses need to turn euphoric before one abandons the ship. It is not the time to abandon ship, but it is time to take a breather and let the storm clouds pass. 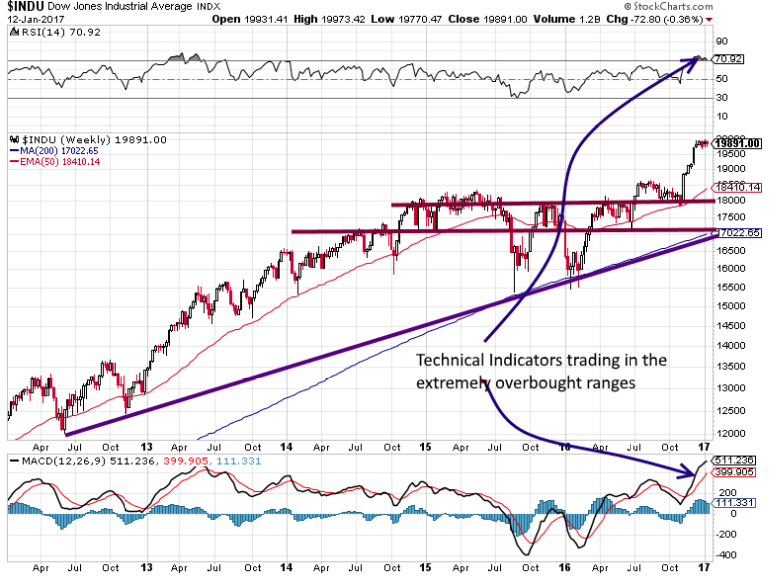 The Dow industrials exploded upwards and have experienced a near vertical move over the past two months. Under such conditions, one should not be shocked if the markets let out a stronger dose of steam than they have over the past 24 months.